Walid Phares " "The Lost Spring: American Policy in the Middle East and Catastrophes to Avoid"
Author Dr. Walid Phares at the launching of his new book "The Lost Spring: American Policy in the Middle East and Catastrophes to Avoid"
Iran Roundtable – Washington: Dr. Walid Phares, a Middle East expert and advisor to members of Congress and the European Parliament and an Advisory member to Iran Roundtable participated at the Politics and Prose luncheon to launch the publishing of his new book: The Lost Spring: American Policy in the Middle East and Catastrophes to Avoid. 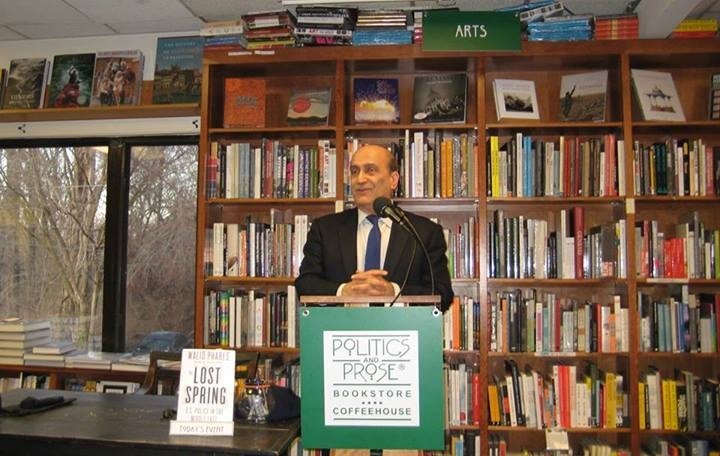 At a launching event organized at the historic landmark "Politics and Prose" bookstore in Washington DC, author Walid Phares introduced his latest book, "The Lost Spring: American Policy in the Middle East and Catastrophes to Avoid." After having reviewed the upheavals in Egypt, Libya, Tunisia, Syria, Yemen, Arabia and the tensions in Iraq, Lebanon as well as the popular discontent in Iran. Dr. Phares said "in our previous book of 2010, The Coming Revolution, we projected that civil societies will rise, that the Islamists will seize the revolts at first, that there will be civil wars and that eventually civil societies forces will come back in a new spring. The question is what will the West and the United States in particular do about it and with whom will they side." "There are no alternatives to backing civil societies, democracy forces, women, youth and minorities in the Arab world, Iran, and the Greater Middle East. All other policies will end up backing the Jihadists and the totalitarian regimes." he further added. The book discussion drew a diverse audience of concerned citizens, book readers and representatives of various Middle East American groups from Syria, Sudan, Egypt, Iran and more. Dr. Karim Abdian, an Arab-Iranian and Iran Roundtable Founder and Board Member also participated at the event.